For 8 years, Bull-it has been working alongside Covec materials, to develop innovative, high performance impact and abrasion resistant materials, specifically for motorcycle use. This innovation in material design has been backed by companies such as the Satra Technology Centre testing facility, the University of Manchester, Hampshire Fire & Rescue Road safety division and Materials KTN, a UK government body specialising in technical material innovation. Testing - EN17092 (Draft) – A new testing standard (EN17092) or the “Damstadt test” is currently in its draft stages but should be rolled out later in 2018 or, and more likely 2019. The new standard EN17092 should make it much clearer for everyone in the industry and the consumer to see the benefits much more clearly, of the three tested components, abrasion, seam burst and tear, only the abrasion differs from the old standard. The current CE testing standard would simply test material for abrasion resistance until it failed, grinding the material down in one direction until a hole is made through the material by which point it has failed and a time is recorded. However, test results from test house to test house can vary due to variances in the test equipment used. AAA = 120KPH Pass, the highest level for Abrasion resistance. 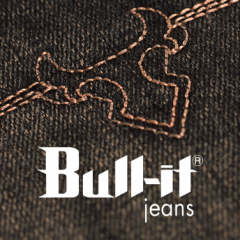 Bull-it and Covec have been working together over the past year to test all our 17 range against EN17092 and to continue to offer our customers stylish casual motorcycle clothing tested to the highest standard. To understand the above and the protection we offer, we have 3 levels of protection in our 17 range: The Stealth Range – A Oneskin single layer denim motorcycle jean that incorporates Covec yarn directly into the denim structure itself. The Stealth range is as close as you can get too a normal pair of jeans. Tested against EN17092-3 the Stealth range has a AA rating or a speed rating (SP) of 75KPH all over garment protection for abrasion resistance. SP120 LITE – The LITE range is new to 2018, the LITE is a high-performance motorcycle jean with pure Covec 5-layer laminate protection panelled into the major crash zones of the legs. This new liner allows the jeans to be incredibly light whilst still offering maximum protection to the rider in those zones. Tested against EN17092-2 the SP120 LITE range has a AAA rating or a speed rating (SP) of 120KPH, offering maximum performance for abrasion resistance in zonal protection. SP120 SR6 – The SR6 range is a continuation from previous SR6 models, using the same Covec lining the SR6 Range covers a larger surface area of the legs. Tested against EN17092-2 the SP120 SR6 range has a AAA rating or a speed rating (SP) of 120KPH, offing the maximum performance for abrasion resistance in zonal protection. Many clothing brands use the CE logos on their swing tags, however this does not necessarily mean that the entire garment has been tested. Often the CE logo placed on the swing tags is because the garment has CE tested armour. The European standard for armour is – CE EN1621. CE stands for Conformité Européene, the EN stands for European Norm and the code 1621 refers to the protector’s use, in this case 1621 refers to motorcycle use. The -1 or -2 after the 1621 refers to the location of an armour on the body not the Level of protection it offers. A 1621-1 protector is an amour for most of the body, depending in its shape this will usually be an armour for Elbow/Shoulder/Knee/Hip. This is usually specified on the armour itself in the CE stamp as shown in the diagram. A E/K armour will fit the elbow/knee for example. Level 2 protectors: The maximum transmitted force must be below 9 kN, and no single value shall exceed 12 kN. High Risk – high risk zones are areas most likely to take impact and abrasion resistance, these areas are shoulders, elbows, forearms, hips, buttocks, sides of legs, knees and shins – Zones 1 and 2. For a AAA rating in these zones, the garment must be constructed of material with a minimum speed rating of 120KPH. Moderate Risk – moderate risk zones are everywhere else between the high and low risk zones, back, side front of chest, back and front of thighs etc – Zone 3. For a AAA rating in these zones, the garment must be constructed of material with a minimum speed rating of 75KPH. Note: Zone 1 sits within Zone 2 and is the area of coverage provided by impact protectors (shoulders, elbows, hips and knees) tested and approved to European Standard EN 1621-1. The above applies only to the AAA rating. Further details below show what is required of AA and A standards. The tear resistance of each garment is tested once again by its specific zones. The resistance in zone one is required to be much greater than that of zone 3. Testing of tear strength is done by applying sharp force to a material sample first in the warp and another test in the weft of the sample. Each zone of a garment needs to withstand the following force to pass AAA. Zone 1 – 50NM – High Impact and Abrasion zone. Zone 2 – 50NM – High Impact and Abrasion zone. Zone 3 – 35NM – Moderate Impact and Abrasion zone. A garment is only as strong as its seams strength. Where two materials meet this creates potential weakness in a garments integrity and so seam strength must be tested vigorously. Seam strength is tested once again against the zones of the garment and each level (AAA,AA,A) its own criteria to pass. A seam is tested by grinding a layer off the top of the seam, then the seams strength is calculated by the breaking force times the length of seam tested. Pass ratings for seams are displayed in the table below. Bull-it products use Covec materials and are tested to achieve a specific level of performance, with regarding too the testing outlined above, all our products have the testing level they have achieved outlined in their product name for example SP120 = AAA abrasion resistant. All Bull-it products come with a detailed swing tag, with the product features, test data and in depth details of the Covec material used in each product.